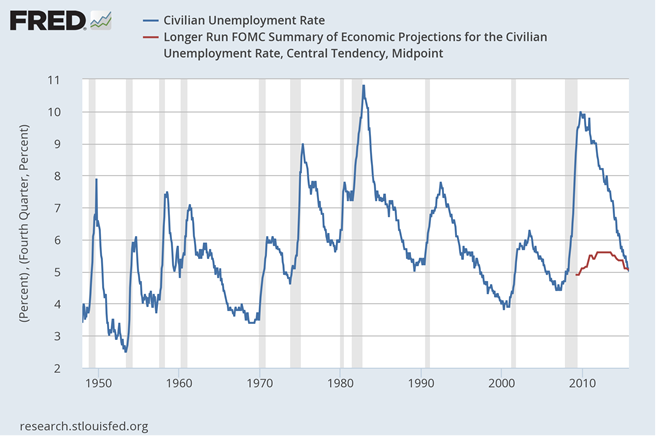 Every time I see the chart for US unemployment these days it looks like it is time for the trend to turn. Economies move in cycles and it sure looks like it’s time for this cycle to turn. Who will kill the current upswing? Well no-one will be responsible, these things are just cyclical, aren’t they? Or is there a killer on the loose? The little red line is driving someone mad. Even a well known dove appears to have given up the fight against a December rate rise. Ms. Yellen made her case like a prosecutor making a courtroom closing argument. She presented it in a 40-page speech at the University of Massachusetts in Amherst, including 40 academic citations, 34 footnotes, nine graphs and an appendix. What she´s doing is prosecuting the people! If she only for a minute thought outside her “Phillips Curve Box”, she would be free to entertain the hypothesis that the Fed´s tightening that has been going on for more than one year is the major force behind the fall in oil prices, commodities in general and the strengthening dollar! Let´s just wait for the formal crowning of the “biggest mistake of the year”. Note: I think another “postponement” will happen! Is “zero” an unavoidable magnet or sign of Central Bank incompetence? But wait, why is raising rates from zero so difficult? It seems like you should just be able to … raise them from zero. Well, there are two problems with that. The first is that an economy that needs zero interest rates is probably an economy that needs even more than zero interest rates. It probably needs negative interest rates, like the U.S. did, but can’t get them since central banks can’t cut rates that far without lenders hoarding money rather than paying people to borrow it. Now, it’s true that central banks can make up for at least some of that by buying bonds with newly-printed money, but they don’t like to do that. The result is that economies with zero interest rates don’t get as much monetary stimulus as they need, so they don’t grow as much as they could. And since rates follow growth, that means there isn’t as much pressure for rates to rise once they do fall to zero. 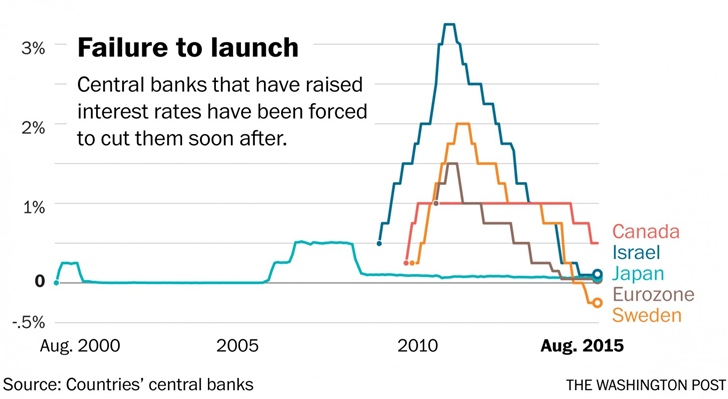 The second reason lifting off is hard to do is that central bankers want to do it too much. They just don’t like zero interest rates. Central bankers, after all, are supposed to be the ones taking away the punch bowl just as the party gets going, not plying recovering alcoholics with bottomless booze. Or at least that’s what they tell themselves. To top it off, today the alternative measure of inflation, the CPI, declined 0.1% in August over July. The core version showed an increase of 0.1%! The Fed just doesn´t get that its incompetence is contributing to the fall in oil (and commodity) prices! 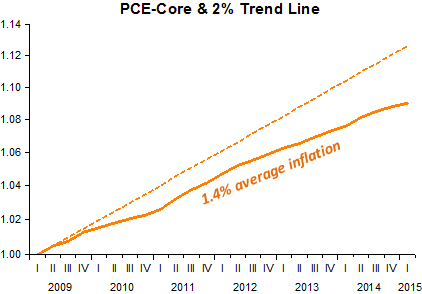 Bottom Line: The baseline path for interest rates is a delayed and gradual rate hike scenario beginning mid-2015. 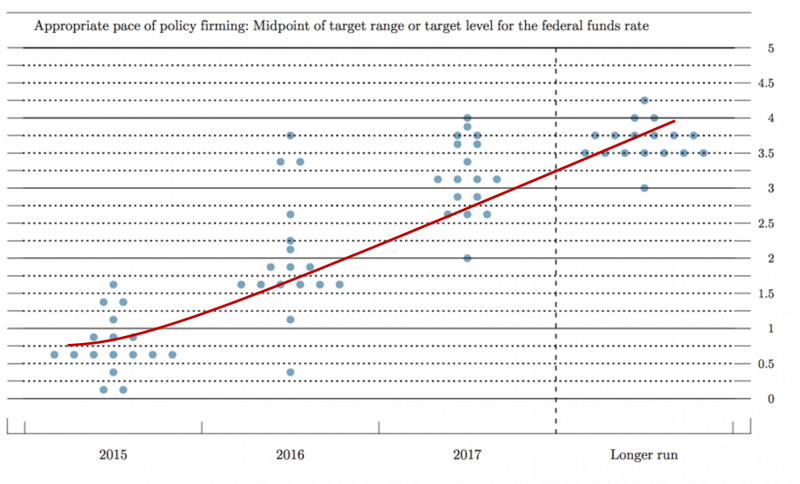 It seems reasonable, however, to believe that the risk is that this baseline is too dovish given the general progress toward the Fed’s goals, a point made repeatedly by Fed hawks. Internal dissension to the baseline would only intensify in the face of another six months of generally solid economic news, especially on the labor front. Yellen would not want to risk the recovery, however, on an overly aggressive approach, especially in the face of low inflation. Considering the path of the data relative to the various policy factions with the Fed, I believe the risk is that the Fed pulls forward the date of the first rate hike as early as March – still seven months away! – while maintaining expectations for a gradual subsequent rate path. If you were looking for fireworks from today’s FOMC statement, you were disappointed. Indeed, you need to work pretty hard to pull a story out of this statement. 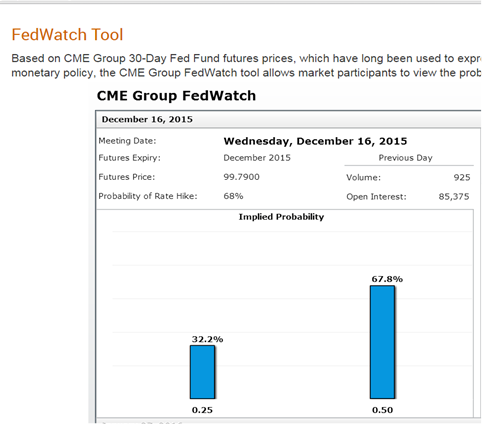 It provided little reason to believe that the Fed has shifted its view since December. A June rate hike remains the base case. The Federal Open Market Committee meets this week to discuss the path of monetary policy. Any possibility of a rate hike at the meeting’s conclusion on Wednesday was already crushed under the weight of weak data early in the year. To be sure, the data support the transitory nature of the weakness, justifying Federal Reserve Chair Janet Yellen’s optimism last month, but it remains too little, too late. Instead, turn to September as the next opportunity for the first rate hike of this cycle. When will the Fed recognize its failures? Everybody and the Pope is waiting for the end of the FOMC meeting on Thursday, particularly if it will signal the time of the “feared lift-off”. The trouble is that the Fed thinks that for the past six years it has followed an “easy” or “accommodative” monetary policy by keeping interest rates on the “floor”! The opposite, however, is true. Monetary policy has remained tight, or even very tight, throughout this time. What if interest rates are low because expectations of inflation and nominal spending growth are low (as Friedman reminded us long ago?). This might be so because “modern” central banking has shunned what´s going on with the money supply; and low money growth is the driving force behind today´s low interest rate, inflation and spending growth! The charts illustrate the argument. 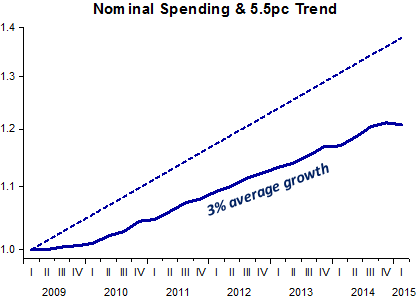 Conservatively, I have let the initial (2008) drop in the price level (relative to trend) and the initial fall in nominal spending (NGDP) relative to trend to be bygones, forever forgotten. Even so, the price level remains far below what it should be if the 2% target had been pursued during the recovery and the level of spending remains far below the level that would have materialized if the Fed had “cranked” a 5.5% nominal spending growth (the “Great Moderation” NGDP growth rate) after NGDP tanked in 2008. 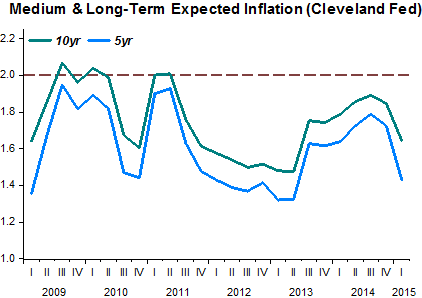 Not surprisingly, both medium and long-term inflation expectations have recoiled during the recovery. 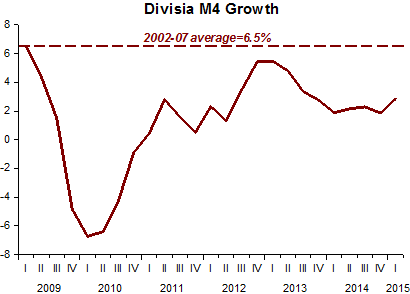 And all this naturally follows the very low rate of broad (Divisia M4) money growth observed during the so called recovery! By concentrating attention on interest rates and showing “eagerness” to get them up, the Fed will instead throw the economy to the ground!